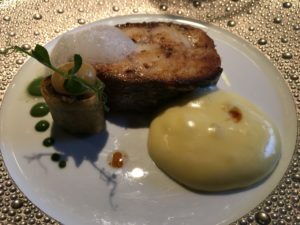 On a previous vacation, I had eaten at the Las Vegas L’Atelier location after Michelin had pulled out of Vegas (grrr…), so it seemed fitting that I dine at the two-starred Paris operation for our high-end dining experience in France. L’Atelier’s modus operandi is an open kitchen surrounded by a U-shaped bar, with other seating on the periphery. Watching the kitchen in action at a place like this is an impressive show! A black and red colour palette in the dining room keeps things crisp and modern while avoiding the painfully neutral stylings of many contemporary restaurants. 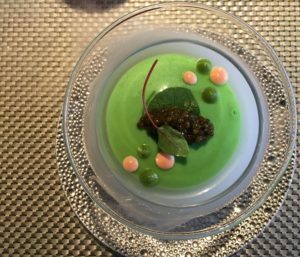 I went for their 10-course tasting menu (189€), while my fish-adverse wife dined a la carte. I’ll only go over my meal, as that’s more than enough as it is! 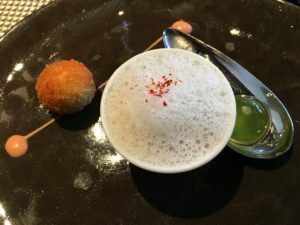 Les trois amuses-bouches – A wonderful mix of tastes and textures: a jelly ball that burst when you chewed it, rich parmigiano and foie gras foam, and a salt cod croquette. 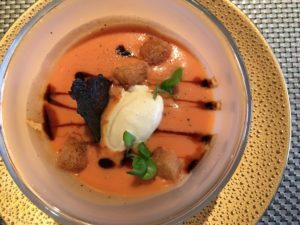 Gazpacho – Great charred tomato flavour, with added richness from the cream and balsamic. Le crabe royal – This dish was an impressive sight with dry ice emanating CO2 “smoke” from beneath the glass holding the food. Shredded crab lay below avocado cream and caviar, with dots of tomato and green curry sauces. Each spoonful was a delight. 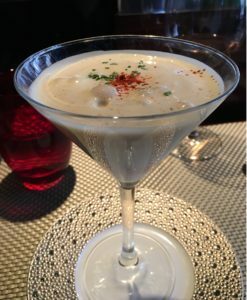 L’oeuf – An egg yolk in a carbonara sauce, served in a martini glass. It was relatively simple, but rich, smoky, and delicious. For the record I resisted drinking it straight from the glass – but just barely. 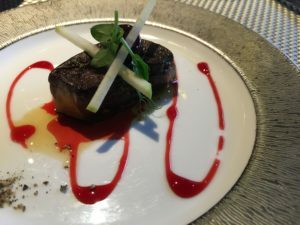 Le foie gras – A fantastic sear gave the foie gras a steak-like essence and super crisp exterior, balanced against a sweet cherry sauce and julienned sticks of tart apple. 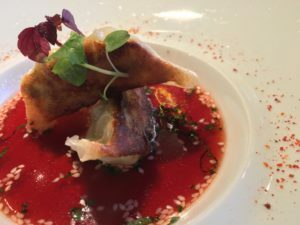 Le gyoza – The most expensive dumplings I’ve ever had. The gyoza had good wrappers and I enjoyed the contrast been the grilled and non-grilled sides. The bouillon they sat in had a nice flavour of ginger and a little spice, but I prefer dumplings not to come sauced as it ruins the structural integrity of the wrappers. Le bar – The balsamic swordfish was perfectly cooked, and came with a rich, ultra-creamy sabayon sauce and bright dots of verveine. 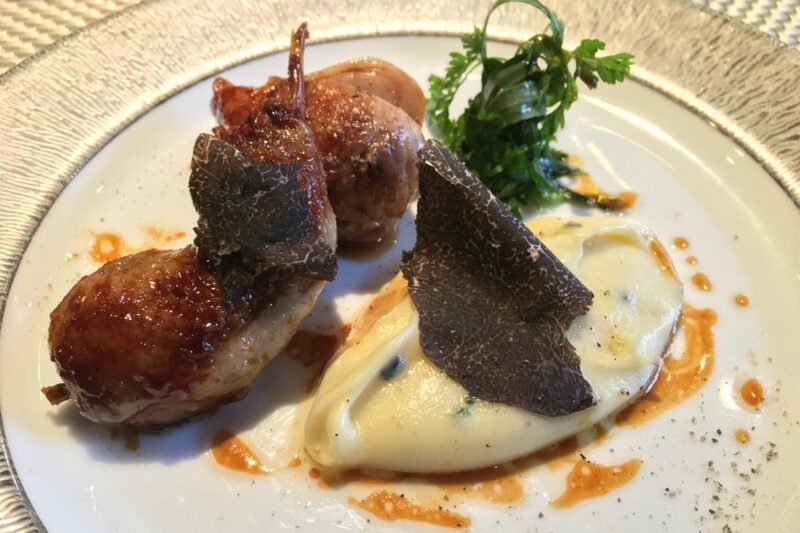 La caille – This foie gras-stuffed quail raised the bar on richness even further. 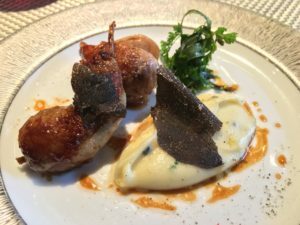 La caille was served with my first introduction to L’Atelier’s famous potato puree – which is likely more butter than potato – but my god it was good. Oh, and it was also topped with shaved black truffle. This dish’s calories were definitely worth it. 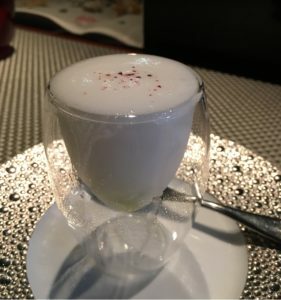 Le concombre – For a palate cleanser, this cucumber sorbet with lemon foam was perfect: light and refreshing, it was a stark contrast to the foie/quail/ butter/truffle flavour behemoth of my previous course. 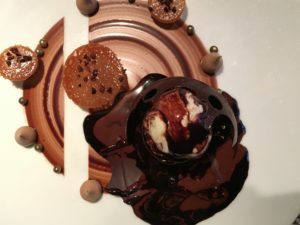 Le chocolat tentation – beautifully geometric, this multi-chocolate dessert had an impressive presentation, with warm chocolate being poured over, and melting, a chocolate globe. Sweet tooth: satisfied. Service was largely impeccable, with great knowledge of the menu and professional service through and through. We had noticed that one of my wife’s appetizers never came from the kitchen, and at that point in the meal, it wasn’t worth bringing up. The staff were noticeably mortified, and quickly struck it from our bill. While my wife was even more mortified at the total of our bill, it was a fantastic gastronomic experience and was certainly one of the culinary high points of our trip to France.